Circulating tumor DNA (ctDNA) detection has great potential to complement invasive biopsies for cancer patients. Emerging clinical applications for ctDNA include guiding therapy, monitoring resistance over the course of therapeutic treatment, monitoring relapse post-therapy, and possibly screening for early detection. As a circulating biomarker, this non-invasive method of detecting important changes in the cancer genome is positioned to revolutionize cancer analysis and treatment. With the liquid biopsy market estimated to reach $20B by the year 2020,¹ several ambitious clinical trials such as one sponsored by GRAIL called The Circulating Cell-free Genome Atlas Study (CCGA) (examining 10,000 cancer- free individuals prospectively over the next five years), and another sponsored by Cancer Research UK called TRACERx (tracking 850 lung cancer patients for intra-tumor heterogeneity and clinical outcome after surgery) have already been launched. In addition, a large amount of investor funding and commercial interest has been generated. As an emerging diagnostic, many commercial laboratories focus their efforts on developing exquisitely sensitive assays that can detect the diverse types of specific cancer-driving mutations present in minute quantity, often down to one part in one thousand (0.1%). The targeted sensitivity of these new assays is much higher than that of the solid tumor profiling assays implemented in just the past few years, given that somatic variants may only be present at under 1% in half the samples. As with many competitive fields, obtaining performance claims for your assay requires an objective measure by which these claims can be evaluated. Similar to next-generation sequencing (NGS)-based solid tumor profiling assays, the majority of these ctDNA tests are ”laboratory developed,” requiring significant time, effort, and resources to develop and carefully validate their performance characteristics. Compounding the challenges for laboratories are the scarcity of many rare variants and limited supply of naturally occurring reference materials (that is, remnant patient samples) with which to characterize these assays. Until now, advances in liquid biopsy technology have outpaced improvements of accompanying ctDNA QC materials and methods. The lack of a sustainable source of patient-like reference materials with rare, pathogenic variants has frustrated both assay developers and clinical laboratory directors. SeraCare developed the Seraseq Circulating Tumor DNA Reference Material and Mutation Mix v2 to overcome the inherent challenges of using remnant patient samples and ultrasonicated cancer cell lines for ctDNA assay development and validation. The fundamental shortcomings of using remnant patient samples are that they are neither renewable nor well characterized, and sampling from patients undergoing treatment is not always possible. These specimens tend to be biased towards more common driver genetic variants, and finding clinically important, but rarer ones is a difficult task. Any orthogonal characterization and confirmation of these patient specimens only further limits the available material, and larger amounts of material are required in order to show that variants at the lower limit of detection (LOD) can be detected. A prerequisite for orthogonal characterization is that another assay can be found or designed that is capable of detecting the variants with a sufficient sensitivity, which is not a given. In many cases, laboratories have turned to characterized cancer cell lines to support their development and validation efforts. In order to produce purified circulating tumor-like DNA in the laboratory, scientists take these characterized cell lines and use ultrasonication or enzymatic digestion to randomly shear their genomic DNA into an appropriate, ctDNA-like size: roughly 170 bp in length. However, this approach has several limitations including the relatively broad size distribution, as there is plenty of material larger or smaller than the ideal length. Additionally, since random ultrasonication damages DNA ends, even after enzymatic end-repair, it will take 2-3 times the input amount of this material to match the NGS library yield. SeraCare has developed a proprietary reference material technology that overcomes the problems of low library yield and low library complexity that using sheared cell-line DNA presents. Moreover, SeraCare has also developed a proprietary, patient-like material with dozens of mutations at known, pre-defined allele frequencies in a synthetic human plasma matrix. mutations (INDELs) and DNA structural variants (SVs). These mutations are identical to those found in the complementary Seraseq Tumor Mutation DNA Mix v2 for solid tumor profiling. Table 1 illustrates the 23 genes with actionable variants in the Seraseq ctDNA v2 reference materials. The full list of 40 mutations is available here. Table 1: List of 23 actionable genes in the Seraseq ctDNA v2 products. The list of the 40 individual variants is available here. It is important to have reference materials with DNA sizes near 170 bp to mimic native ctDNA. Equally important is the size distribution. Ultrasonication and other methods tend to produce DNA fragments with broad distributions that often extend well above and below the 170 bp average. Smaller fragments may exhaust the limited number of primers available for library selection or enrichment, while larger fragments may overstate the number of available molecules for detection. Figure 1 shows a comparison of ultrasonicated cancer cell-line DNA to native ctDNA and the Seraseq ctDNA Mutation Mix v2. Figure 1: Three types of fragmented DNA: random ultrasonicated (green), native cfDNA (orange), and the Seraseq ctDNA Mutation Mix v2 AF 0.5 (blue). Samples were characterized by the Agilent 2100 Bioanalyzer®. Note the sharp size distribution of native cfDNA in orange around 170 bp, and the smaller 340 bp peak. It is thought that these peaks represent single nucleosome-length (170 bp) or double nucleosome-length (340 bp) fragments of DNA.² The peak in blue demonstrates how close the size distributions of the Seraseq ctDNA Mutation Mix v2 and Seraseq ctDNA Reference Material v2 are to native cfDNA. This close size distribution contrasts sharply with the less precise ultrasonicated method. To further illustrate the patient-like characteristics of the Seraseq ctDNA v2 reference materials in comparison with materials created using ultrasonication methods, it is helpful to analyze the challenges of library yield and sample complexity. The Seraseq ctDNA v2 reference materials allow up to four times the library yield and complexity of ultrasonicated DNA: even when adding 2-3 times the mass of input ultrasonicated DNA to compensate for the library construction efficiency loss (see Figure 2). In other words, one vial of Seraseq ctDNA v2 provides the amount of output library as from about four vials of the equivalent amount of ultrasonicated DNA. Because the amount of Seraseq ctDNA v2 material used per run is the same as the patient sample being sequenced, an accurate measure of assay performance is provided. Figure 2: Comparison of ultrasonicated DNA to two development batches of the Seraseq ctDNA Mutation Mix v2 run in duplicate. Both library yield and number of unique molecules are scaled on a relative basis. If a given assay has a 1 μg library yield with 10 ng of native ctDNA input, it may take 30-40 ng of ultrasonicated material to achieve that same amount of library. It is believed that damage to the DNA ends (even after enzymatic end-repair) or other DNA damage to the fragment itself for PCR-enrichment approaches are the main causes of this inefficiency. In order to achieve the types of low allele-frequency detection that are required for ctDNA assays to be effective, it is important to have high library complexity and a balanced representation of the genome. But library complexity is compromised when using ultrasonicated or enzymatic fragmentation approaches. These tests strive for sensitivities down to as low as 0.1% mutant allelic frequencies across the range of variant types in the specimen - well below the inherent error rate of NGS systems. To overcome this, many assays use molecular identifiers (also known as molecular barcodes) to tag unique DNA molecules and increase sensitivity. If the resultant library construction is insufficiently complex, then there is a high risk that the rare mutation will remain undetected. In this case, ultrasonicated DNA reference materials would not provide the level of performance needed by laboratories for the development and validation of these assays, regardless of the amount of input material. With 30 ng of ultrasonicated DNA as input material (~5 ml of plasma or one Streck® tube), there are approximately 9,000 total copies (including mutations) in that sample. If the target mutation is present at 0.1%, then there are only nine copies of that mutation in the 30 ng of input. If, on average, only two of those molecules end up in a library, then there is a ~14% chance that no copies of a given 0.1% variant will end up in a library. Ideally, an assay should observe the variant on several different molecules of cfDNA. If three different molecules are required – when the average is two – then ~68% of 0.1% variants would be missed. If the average is five, then only ~12% of 0.1% variants would be missed. With the Seraseq ctDNA v2 reference materials, library yields and complexity closely resemble those of native cfDNA, and the clinical laboratory can get an accurate measure of their assay’s performance at low minor allele frequencies. The Seraseq Circulating Tumor DNA v2 reference materials are demonstrably superior to ultrasonicated cancer cell lines. 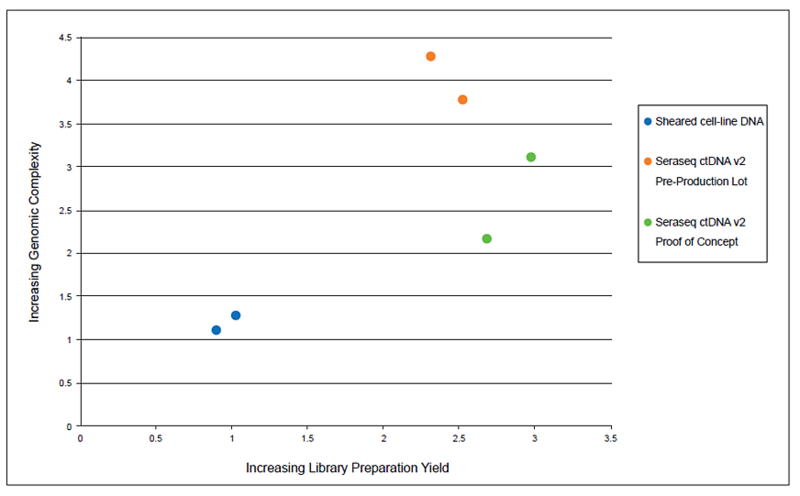 The DNA size distribution, library complexity, and over two-fold increase in library preparation yield demonstrates performance very similar to native cfDNA for sensitive ctDNA assays. The additional feature of 40 important somatic variants at highly precise mutant allele frequencies and choice of formats (purified DNA or full-process in synthetic plasma) makes the Seraseq ctDNA v2 reference materials ideal tools for laboratories developing and validating these assays.